Asaysh (security) department in Sulaimani, Kurdistan Region of Iraq, denied approval for a group of CPT trainees to conduct a public action in solidarity with the government employees, which was planned to take place in Azadi (freedom) Park, Sulaimani, on the February 19, 2016. After the regional government of Iraqi Kurdistan (KRG) failed to pay the public sector employees salaries for the last 5 months, a number of public sector employees in Sulaimani went on a strike demanding their rights in salaries, including, but not limited to, teachers, traffic police, and doctors. CPT trainees group of 2016 in Sulaimani, prepared a public action to show their appreciation for the hard work the employees have been doing without being paid for such a long time, and to show their support for the employees demand for their rights at the same time. This would have been demonstrated through a short theatrical performance by the trainees, with the support of CPT team in Sulaimani. After the trainees and CPT team spent several days in the process of receiving a security approval, the Asaysh department denied the approval for the action. Asaysh officials’ justification was that ‘’they will not allow any destructive action to take part in Sulaimani’’. 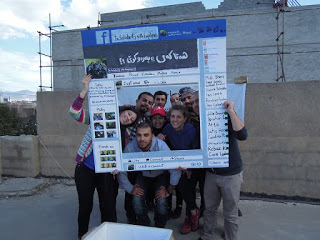 CPT trainees decided to show their support for the employees, despite the fact the Asaysh prohibited them to conduct their performance in public, and that’s through conducting the performance on the rooftop of CPT office in Sulaimani, and publishing a video of it through social media. CPT trainees in Iraqi Kurdistan organized this action to show solidarity with the unpaid government workers in Kurdistan. Authorities denied approval for this action to take place as planned in Azadi Park in Sulaimani, Iraqi Kurdistan on Feb 19th 2016 .